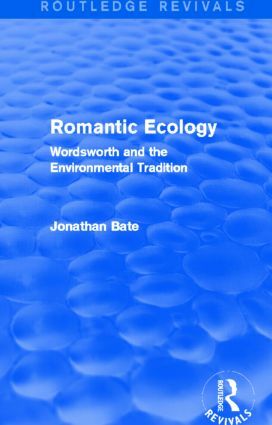 First published in 1991, Romantic Ecology reassesses the poetry of William Wordsworth in the context of the abiding pastoral tradition in English Literature. Jonathan Bate explores the politics of poetry and argues that contrary to critics who suggest that the Wordsworth was a reactionary who failed to represent the harsh economic reality of his native Lake District, the poet’s politics were fundamentally ‘green’. As our first truly ecological poet, Wordsworth articulated a powerful and enduring vision of human integration with nature which exercised a formative influence on later conservation movements and is of immediate relevance to great environmental issues today. Challenging the orthodoxies of new historicist criticism, Jonathan Bate sets a new agenda for the study of Romanticism in the 1990s.